Calabrese Barton, A., Tan, E., & Rivet, A. (2008). 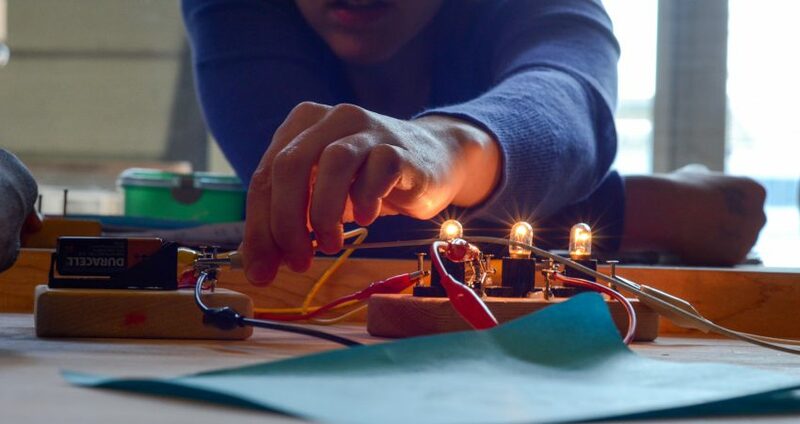 Creating hybrid spaces for engaging school science among urban middle school girls. American Educational Research Journal, 45(1), 68–103. Calabrese Barton, Tan, and Rivet examine the ways in which urban middle school girls engage with science whilst they develop and maintain identities and practices that support who they are and who they want to be. The broad context for this 2008 study remains pertinent today: Girls’ achievement in science is equal to boys’ achievement, and yet girls tend not to identify with science or to pursue science education or careers. The researchers conducted ethnographic case studies of students in grades 5–8 in three U.S. schools between 2003 and 2005. They regularly observed science classes, interviewed the students, and collected examples of student work. Using this longitudinal body of data, the researchers traced the girls’ participation in science over time. They identified three distinct practices the girls used to create hybrid spaces, through which they entered into the discourse of science. Signature science artefacts. Students created their own ‘artefacts’ in response to learning tasks. These artefacts—for example, songs, diagrams, models, or skits—enabled the students to express their sense of self even as they completed the learning tasks. Such artefacts both come from and contribute to a new kind of hybrid space that allows the young peoples’ interests and cultures to sit alongside the culture of the science classroom. Playing with identities. The researchers observed many of the girls ‘playing’ with new identities. They acted out characters, showcased humour, and engaged in physical role-playing. The lighthearted mood of this play reduced the risk of failure: the failure either of not knowing the correct answer or of being thought ‘uncool’ if they did know the answer. Negotiating roles through strategic participation. Students co-opted the standard classroom rules in ways that allowed them to retain their own styles of interaction. For example, though the class rule was to remain seated, one student was able to move around the room because she was also asking science questions and sharing her findings with peers and the teacher. The student used ‘science reasons’ to legitimate walking around, interacting with friends, and conversing without raising her hand. Previous studies have described the way in which the science classroom is its own subculture with particular ways of knowing, talking, and doing (see Aikenhead & Jegede, 1999). This subculture may not always align clearly with the cultures that young people bring to learning science. To make sense of how young people participate in new cultures and work to create hybrid spaces, the researchers drew on lenses of practice and identity. Building on the work on Lave and Wenger (1991) and sociological perspectives on education (see Brickhouse & Potter, 2001), the research is framed by an understanding that learning science involves learning not only content, but also how to participate in science practices. In addition, it requires aligning or merging one’s identity with that of the dominant authority—in this case, the values of school science. This study reminds us that when planning efforts to support girls (and indeed all young people) to engage with science, informal educators need to consider not only students’ varying funds of knowledge and cultural experiences but also the ways in which students may apply these resources in order to support who they are and who they want to be. By allowing and legitimating the efforts of young people to merge their knowledge and identities with those of the science learning environment, informal educators can support the creation of hybrid spaces. Such spaces are generative: They facilitate young people’s alignment with science by rendering it less foreign and more connected to their everyday living. Aikenhead, G. S., & Jegede, O. J. (1999). Cross-cultural science education: A cognitive explanation of a cultural phenomenon. Journal of Research in Science Teaching, 36, 269–287. Brickhouse, N., & Potter, J. (2001). Young women’s scientific identify formation in an urban context. Journal of Research in Science Teaching, 37(5), 441–458.